From 2007, SERVICE NGO based at Namakkal District in Tamilnadu, India which has over 21 years of experience in the field of disability sector, has established a special school for mentally challenged children in Namakkal by name ANBALAYA with an aim to ensure an enabling safe environment, education, special learning practice, care taking services and motivated to acquire skills, equal participation and inclusive lead to the mentally retarded children with mild and moderate towards their self respect and social recognition. ANBALAYA special school is equipped with trained special teachers, physiotherapist and the required equipment for the development of health and education of the mentally challenged children. ANBALAYA also has transportation facilities to bring the children to the special home.We categorize children as as pre-primary, primary and secondary while we enroll in ANBALAYA. Each child is assessed by a development assessment scale. A developmental goal is set for each children and the children are constantly being progressed with the assistance of the trained teachers. 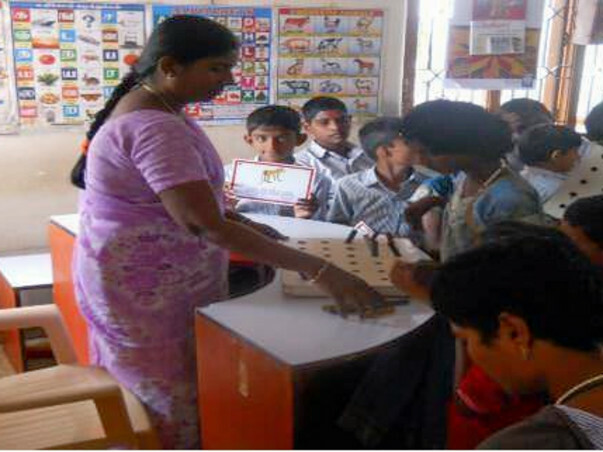 ANBALAYA trains the children on Activities of Daily Living (ADL).